Dingos and Tasmanian devils prey on wombats. Their primary defence is their toughened rear hide, with most of the posterior made of cartilage. 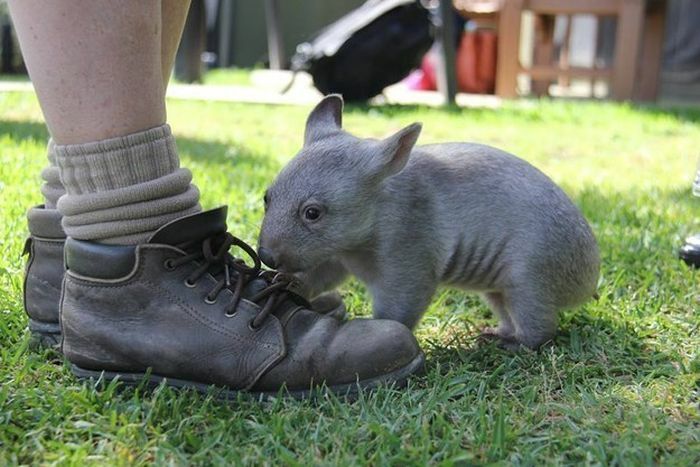 This, combined with its lack of a meaningful tail, makes it difficult for any predator that follows the wombat into its tunnel to bite and injure its target. When attacked, wombats dive into a nearby tunnel, using their rumps to block a pursuing attacker. A wombat may allow an intruder to force its head over the wombat's back, and then use its powerful legs to crush the skull of the predator against the roof of the tunnel, or drive it off with two-legged 'donkey' kicks. Humans who accidentally find themselves in a fray with a wombat may find it best to scale a tree until the animal calms and leaves. Humans can receive puncture wounds from wombat claws, as well as bites. Startled wombats can also charge humans and bowl them over, with the attendant risks of broken bones from the fall. One naturalist, Harry Frauca, once received a bite 2 cm (0.8 in) deep into the flesh of his leg—through a rubber boot, trousers and thick woolen socks. A UK newspaper, The Independent, reported that on 6 April 2010 a 59-year-old man from rural Victoria state was mauled by a wombat (thought to have been angered by mange), causing a number of cuts and bite marks requiring hospital treatment. He resorted to killing it with an axe.